Seasol is a 100% organic extract that provides a synergistic range of natural compounds and trace elements derived from the finest brown kelp in the world. King Island Bull Kelp, Durvillaea Potatorum, grows in the pristine waters of the Southern Ocean off north west Tasmania – far from any possible source of urban or industrial pollution. We collect only storm-cast kelp to ensure sustainable supply. Blended with Ascophyllum from the North Atlantic Ocean and Durvillaea Antartica from the coast of Chile, Seasol offers many premium benefits. The processing plant used to extract the liquid concentrate is the only one of its type in the world. This unique process maximizes the extraction of plant essential compounds ensuring maximum concentration in the product and minimal bi-product waste. More than 90% of the original kelp is fully liquefied and incorporated in the final product. Seasol has been manufactured in Tasmania since the 1970’s. The company has expanded significantly over the years, with huge growth into the horticultural and agricultural markets. Our success is based on consistent product quality, reliable efficacy in a range of commercial applications and results backed by both scientific and field experience. Seasol is a natural product that is non-toxic, safe to handle and easy to use. There is no withholding period following application and no re-entry issues to consider unless Seasol is tank-mixed with pesticide. Seasol provides a synergistic range of natural compounds and trace elements which promote root growth needed for rapid establishment of new plantings. Seasol reduces transplant shock by improving root growth providing better access to soil moisture and nutrients. The use of Seasol as a plant and soil conditioner significantly improves the benefits of a balanced nutritional program for optimizing fruit set and delivering more consistent yields year after year. Seasol enhances the sugar content in some fruits showing higher brix readings. Seasol significantly increases heat & drought tolerance of the plant, by reducing moisture evaporation. It can even reverse the effects of dehydration after a single foliar application. Seasol reduces frost damage, by lowering the temperature at which plant cells will freeze. This ‘anti-freeze’ effect reduces cell damage, allowing the plant to return to productive growth once the temperature improves. Seasol is a food source for microbial flora and fauna in the soil, increasing their numbers and diversity. Highly refined, application friendly Seasol is manufactured to 150 microns and won’t block nozzles in foliar applications. It’s easy to fertigate and mixes well with NPK’s and most micronutrients. Caution use with Ca. 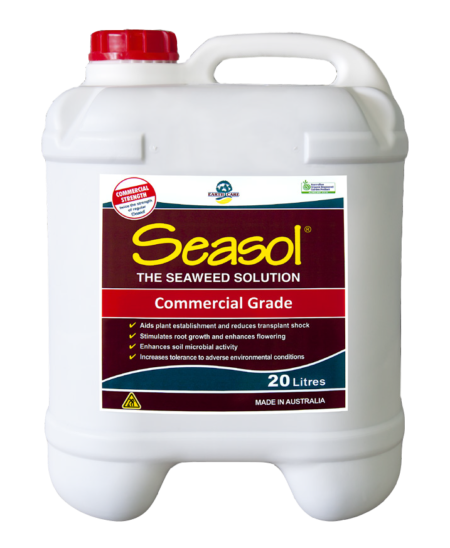 Seasol can be used as a foliar application or applied directly to the soil. Seasol can be applied through boom sprays, air blasters, drip system, micro jet sprinklers and center pivots. Seasol can be mixed with many agricultural chemicals. Compatibility of any chemical should be checked first. Once diluted Seasol should be usewithd within 24 hours. Seasol is safe to use on all plants at all times of the year. Application rates given on the product label show the range within which most general purpose or maintenance applications will fall. These general application guidelines are intended to assist in getting the maximum benefit from each application. 1. Apply Seasol at 2-4 qts/acre. Use lower rates for general purpose or maintenance applications. Use higher rates for plant stress mitigation. 2. Results improve with increasing frequency of application. 3. Water is the carrier, for even coverage. Use at least 1-in-100 dilution. 4. Seasol can be applied by aerial or boom spray, irrigation or fertigation.